These flash cards are more effective and more fun than traditional flash cards because they don't just use plain ol' text. 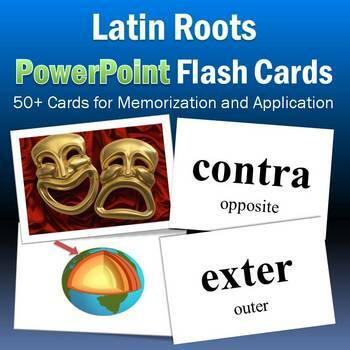 Instead, these flash cards use interesting, colorful, funny images and animations to teach your students the meaning of Latin roots. How does it work? You show an image or animation to the class, and students associate that image or animation with a Latin stem. For example, you might show a slide of an animation of rotating gears. Students look at the gears and think, "Gears, turning, rotating...volv!" They associate the rotating gears with the Latin root volv. A meaningful and lasting mental connection is made. There are two types of flash cards in these sets. One to help students memorize the roots, the other to make them apply their knowledge of the roots as they decode words.. I've used these flash cards many times with middle school and high school English and Science classes. The students enjoy it and it works. Try before you buy! Part 1 of this resource is free. 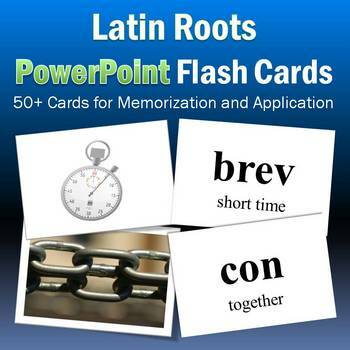 Latin Roots PowerPoint Flash Cards Part 1-FREE! 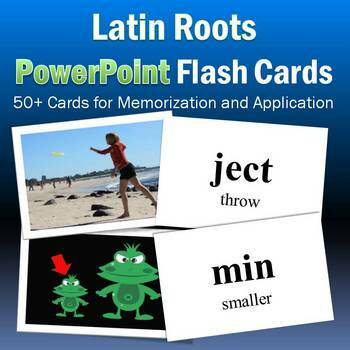 This mnemonic tool works just like flash cards, but it is far more effective and fun because it uses high-quality images and animations to help your students build meaningful and lasting mental connections. Teach to multiple sensory modalities. Information is remembered best if it is interesting or useful. New information is easier to remember if it can be linked to something already stored in the memory bank. Download the free preview to check it out! The free preview is a completely functional version of Part 1. Go over the roots and their meanings with the sudents. Start the presentation on Slide 1. Students look at the image, think about the roots, and call out the root that they think is best represented by the image. Advance the slide, and the correct answer will appear. Advance again to move on to the next slide. In these PowerPoints, you will find three or more images provided for every root, which allows you to use the PowerPoint again and again, practicing the same roots over and over, without boring the kids with the same images they have already seen before. There are enough choices that you will never show the exact same images twice unless you want to. Another reason I provide more than one image per root is that some roots, like cosm or phys, have more than one meaning, so it is important to reinforce all the meanings. Also, having three or more images allows you to tailor the PowerPoint to your students' experience and maturity. I have used this tool many times in the past with great success. I created it when I was teaching summer school English. Classes were long and the students' grade levels were varied. I needed something flexible and fun, easy enough for everyone to understand, and worthwhile. I wanted to teach the students something measurable, so I could be sure they had learned something useful in their five weeks of Summer School. Students enjoyed it and it worked. It's flexible enough to be used for entire periods or small pockets of time. It requires few materials. Forget about spending hours in the copy room duplicating packets or handouts. All the kids need are some roots and meanings written on the board, some notebook paper, and something to write with. It can be used again and again. There are many things I love about using this mnemonic tool in the classroom. Here are just a few. Cross-curricular: Latin roots are found in every subject, from Science to Math to English to Art to Phys Ed. Very little prep time required - just decide what Latin roots you want to cover, mix up the slides, and away you go. Little to no materials required. A piece of notebook paper and a pencil is all the students need. Flexible - use it for an entire period or just a few minutes. Unlike traditional flash cards, these cards will never get lost, torn, or stained. 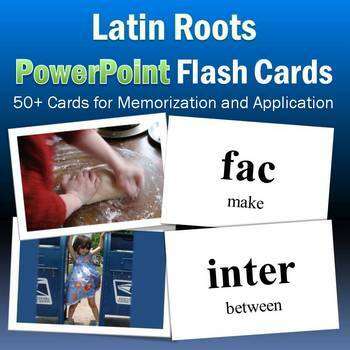 Unlike traditional flash cards, which are small, you can use these flash cards with the whole class, direct instruction.